I am a Modern Singing Teacher with 35 years experience. I teach students one on one and cover all modern musical styles. With more than 12 years Performance Experience I have worked with various bands covering many different genres. I love to teach and watch my students achieve a full range and tonal control in their favourite types of music and gain enjoyment and confidence. With my wealth of experience I am able to tailor a program to suit your style and goals. We focus on the things that are going to bring results fast as well as long term vocal stability. Using my method developed over the past 35 years teaching students of varying ability and goals I have successfully transformed hundreds of voices. By focusing on correct technique you will develop a strong and powerful voice as well as increasing your range and your musical repertoire to enable you to be a versatile performer. You may want to be a professional performer or just want to sing for personal satisfaction... maybe at Karaoke nights, Weddings, Birthdays and other social occasions. It does not matter what your objectives are as the fundamentals of singing are always the same. My proven method will help you to develop the control and technique necessary to achieve the vocal expression and feeling required for performing modern music. Teaching all styles including pop, rock, country, blues, alternative, church singing, theatre as well as general voice production. My lessons are suitable for all styles, ages and skill levels including Professionals. With my weekly structured lessons you can follow your own pathway to the style of singing you choose. Each week we work on songs you have chosen that you long to sing like your favourite artists. We work at your own pace on the music you are passionate about. You are free to explore different musical influences and styles. The weekly exercises, which I call your your “technical ladder” increase your range and your ability to choose different tonal sounds and styles as well as providing a strong foundation that will protect your voice and bring you a long life of singing where you will continue to improve naturally and consistently. I have studied music from a young age learning classical piano for many years. I attended the Melbourne 'Conservatorium of Music' and my teacher was the renowned concert pianist Ronald Farren Price. 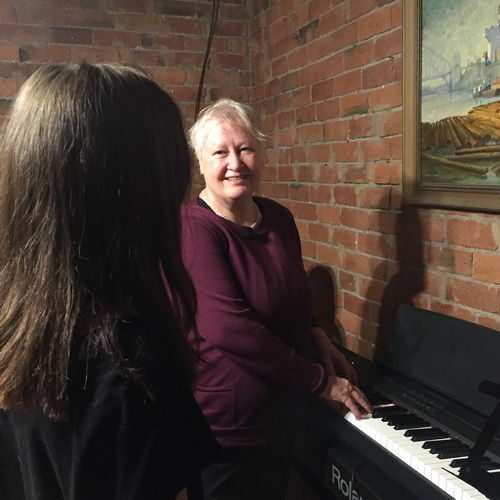 I was personally trained to be a Singing Teacher by the late Jack White who is famous for teaching such names as Olivia Newton-John, John Farnham, Peter Allen, The Bee Gees, Helen Reddy and many more. After completing my training I taught at the Jack White Singing School for a number of years and began performing as well to pursue a professional career. Nowadays my passion is guiding people to find their full vocal potential. I look forward to meeting you and helping you achieve your goals no matter how big or small they are. Lessons are $40 for 30 minutes. Start with a Single Lesson ($40). Fees are then payable 5 weekly in advance ($200) for a set Weekly Time-slot. To book a time that suits you call Jade on 0407 275 217. Singing lessons for students based in Melbourne South Eastern and Bayside Suburbs including Beaumaris, Bentleigh, Black Rock, Bonbeach, Brighton, Carnegie, Carrum, Caulfield, Chadstone, Chelsea, Cheltenham, Clayton, Dingley, Edithvale, Elwood, Hampton, Highett, Malvern, Mentone, Moorabbin, Mordialloc, Murrumbeena, Oakleigh, Parkdale, Patterson Lakes, Sandringham, South Melbourne, St Kilda, Windsor and surrounding areas. “”My teenage daughter was asked to sing at a wedding. She had had lessons with highly recognised names in the industry however had not sung for a couple of years, so we thought we would try and get some lessons to freshen her up. After looking on the Internet, also through the Christmas time, found Jade. What a find. My daughter was surprised how much Jade taught her in such a short time. She sang beautifully and it was a big thank you to Jade that made this happen so smoothly. I highly recommend her. “”If you are seeking to learn to sing or you already sing and are looking to significantly improve your voice then look no further! Jade will take you under her wings, teach and nurture you to find your best voice! I was looking to start singing lesson, for my youngest daughter, last year. We searched the internet for teachers. There were quite a number. I ask my daughter to choose from the ones we looked at. She chose Jade. She was 9 then and is now 10 years old now. What an inspired choice! Jade is just simply amazing! She identifies what has to be worked on and happily and enthusiastically guides you through the required practice. Your voice will certainly get better but it will improve significantly if you perform the practice as regularly prescribed. If you are worried about how much it costs for lesson then don't! You get an experienced friendly, enthusiastic and very, very experienced teacher at a very, very reasonable price. My daughter's voice, in one year, has to be heard to be believed. Yes, I am her dad and you may say I am biased. I am in lots of areas but in singing her voice speaks for itself! Good luck in your vocal journey! “”Working with Jade over the last year has improved my singing beyond belief. Her warm and encouraging nature makes overcoming any challenges so much easier. If you are willing to work you'll get the results that you want with Jade. Her methods and knowledge are deep. An excellent teacher. “”After less than twelve months working with Jade I can actually sing in tune. Jade is patient and caring and the progress that I have made in such a short period of time under her instruction is a testament to her skill as a teacher. If you put in the work and follow Jade’s instruction you will get results! Thank you Jade you are a beautiful human being! Get in touch today so we can start making your ambition a reality. Please include your mobile number so I can contact you via SMS. Thank-you! Private singing lessons that will build your voice and get you moving towards your dream.